Let's talk in computer language. Because my friend and family don't understand it. 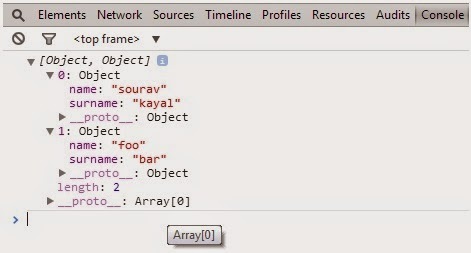 Here is the output; two objects are there but not in neat and clean presentation. The output is like below. We are seeing that the data is presenting in table stricture. It’s easy to read and understand. 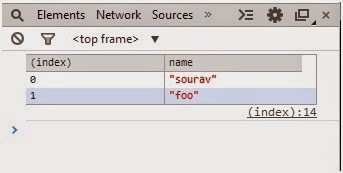 Not only formatted data, console.table gives more control on JavaScirp object presentation. If we want to print only one column, we can do it in this way. Here is output with only name column. All right reserved to Sourav Kayal.Contuct me sourav.kayal@yahoo.com. Simple theme. Powered by Blogger.